Today I am sharing one of my favorite sandwiches! I believe the combination of ham, egg and avocado is perfect, healthy and delicious but this is not all about this sandwich. The main and most important ingredient here is the ajvar! If you don’t have ajvar on your hands, or you can’t find it in your area, let me tell you what it is – it is a dip, prepared from roasted red peppers, roasted egg plants, seasoned with sunflower oil and sea salt. It is super delicious and gives a special flavor to this sandwich. You can easily prepare it at home, in advance and store it in a jar for later. Trust me, you have to try it, if you haven’t already! Sprinkle a little bit of olive oil over the bread slices. Season with salt, pepper and oregano. Grill the bread in a grill pan until fine and crispy on the outside. Cook the egg sunny side up in a frying pan with a little bit of olive oil, season with salt and pepper and set aside. 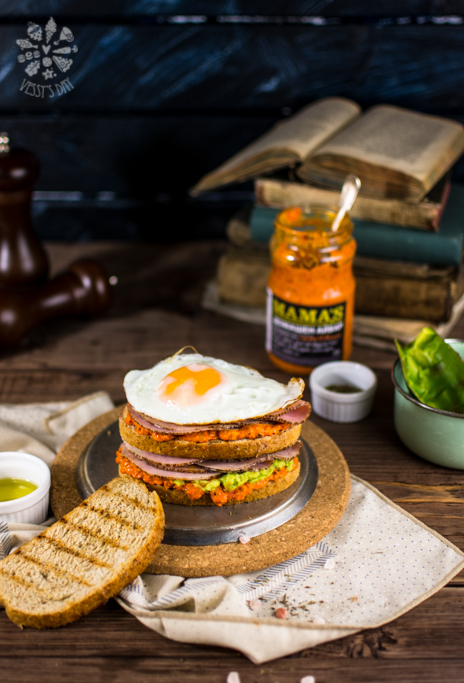 Spread s little bit of the ajvar over the first slice of bread, top it with the mashed avocado, arrange a couple of slices ham over the avocado and place the second slice of bread on top. 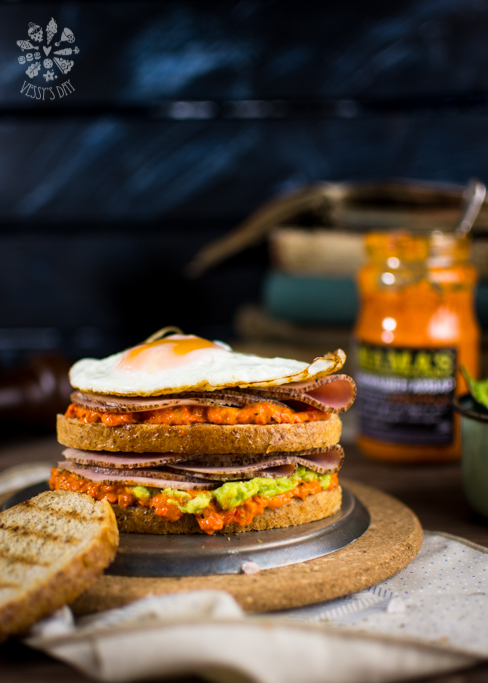 Spread some more of the ajvar and avocado over the second slice of bread and top with ham. Place another slice of bread over the ham and top with the egg. Serve immediately or pack for a lunch on the go! I definitely am taking some inspiration from this post and putting some more effort in next time I make a sandwich. 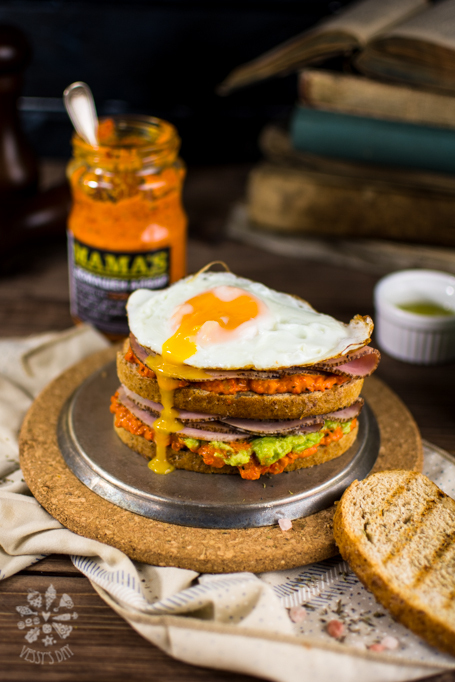 This ham and egg sandwich seriously looks incredible! This sandwich looks amazing. . .and that ajar. . .I must whip up a batch of this as I am certain it throws this sandwich over-the-top. Thank you Lynn! It is really good! You should try to make a homemade ajvar, it is very popular around here and many people do their own at home, instead of buying it.